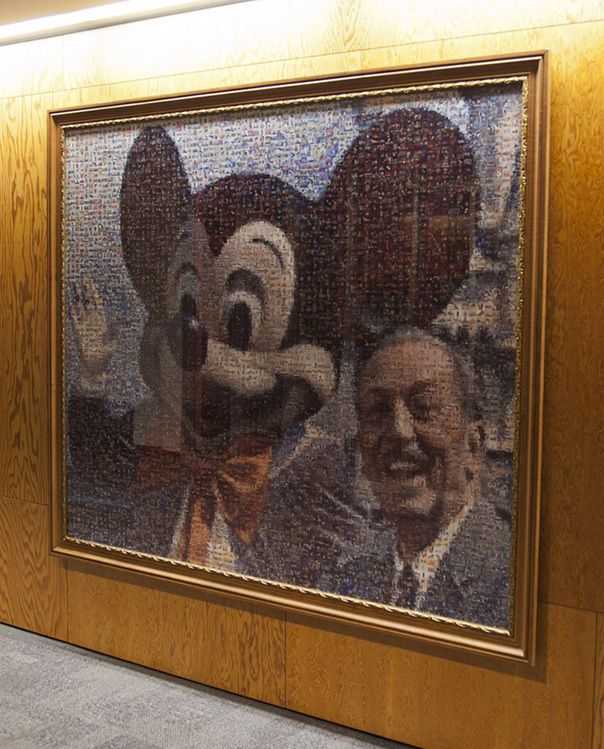 The memorable portrait was recreated for the “Happiest Faces On Earth” photo-mosaic murals featured throughout the park during our 50th Anniversary celebration in 2005. It hung in the foyer of the Main Street Opera House and is now seen by cast members every day as they pass through the lobby of the Team Disney building at the Disneyland Resort. Every morning when I see it I’m reminded of the rich legacy Walt left the world, and in particular to those of us lucky enough to spend every day at the place he loved so much. 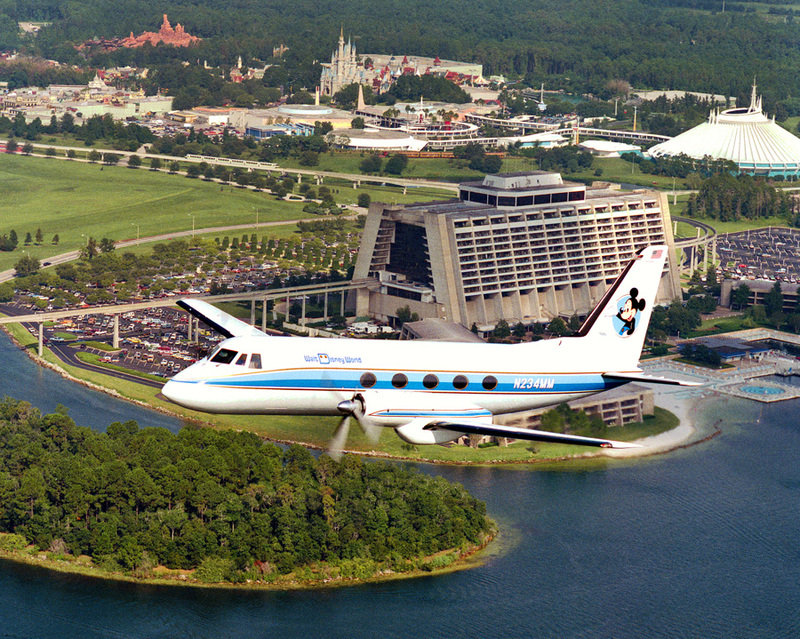 Take a Flight Back in Time with ‘The Mouse’ « Disney Parks Blog. If you’ve ever experienced The Backlot Tour at Disney’s Hollywood Studios, chances are you’ve seen “The Mouse” – a white airplane with a Mickey Mouse icon on its tail. 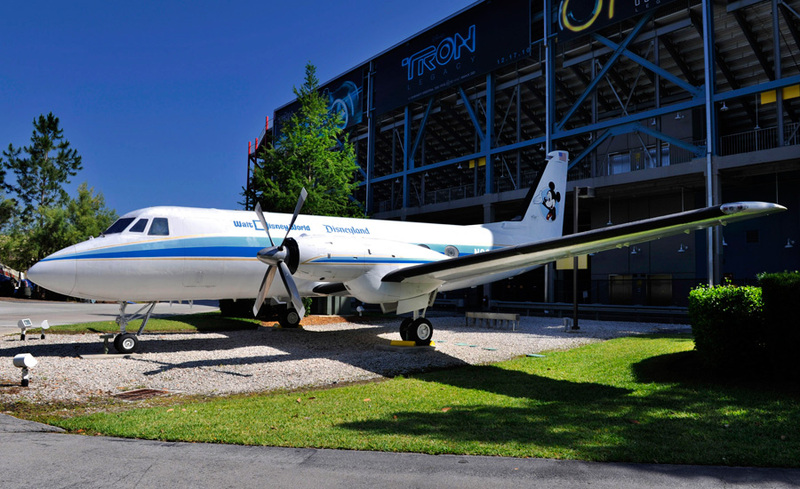 As the tour says, this airplane was used to fly Walt Disney on secret scouting missions over Central Florida when he was looking for the perfect spot to build a second theme park. I’ve always been intrigued by this airplane and the important role it had in Disney history. After digging through our archives, it turns out the story behind this aircraft is actually much bigger than I ever thought. 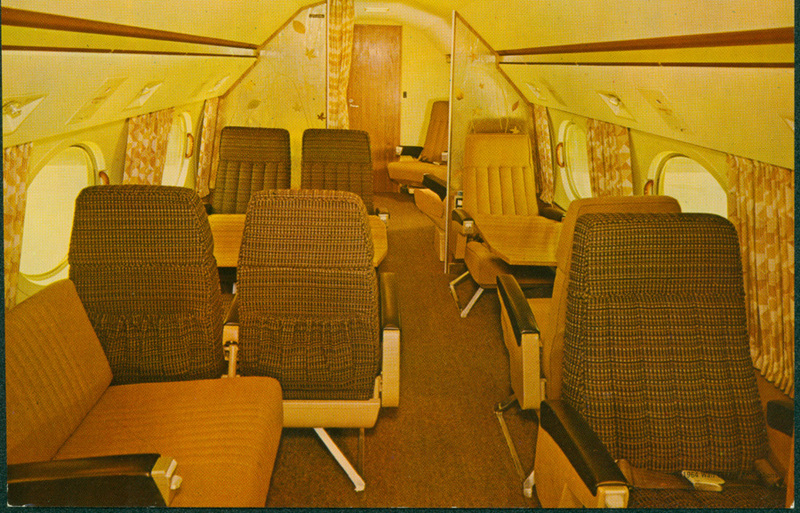 Walt purchased the Grumman Gulfstream 1 (G1) in 1964, and worked with his wife, Lillian, to select the plane’s interior design and color scheme. (Remember, this was 1960s fashion!). The plane seated 15 and featured a galley, two couches and a desk. Walt even designed his own special seat in the plane, which was in the rear left cabin. The seat was equipped with a special altimeter and air-speed gauge, which Walt added to satisfy his endless curiosity about flying. The plane’s first trips took Walt and his Imagineers to and from California and New York to oversee the final preparations for Disney’s contributions to the 1964 New York World’s Fair. 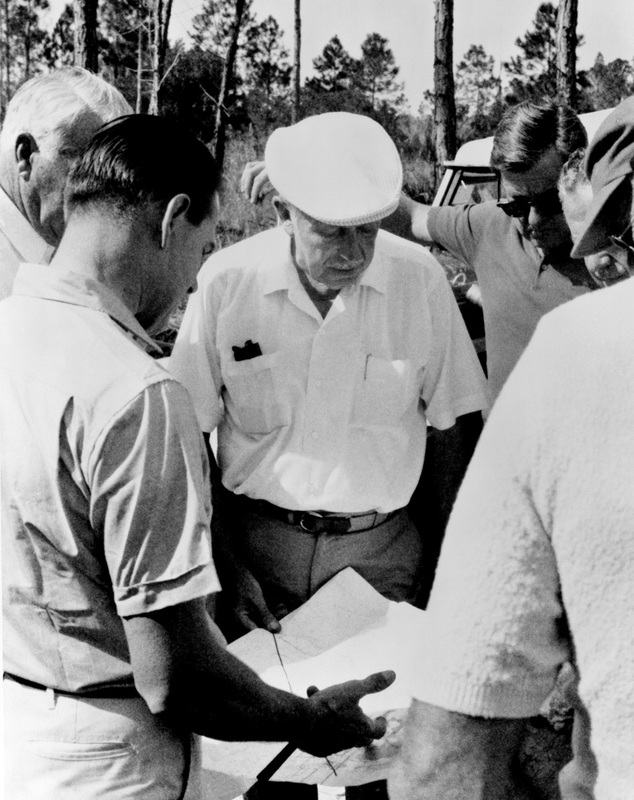 Later that year, Walt (pictured above, center) began surveying land in Central Florida, considering the site a possibility for his second theme park. The plane also led Walt (literally) to find inspiration for the look of one classic Disney attraction. According to Mark Malone, son of Pilot Chuck Malone, Walt spotted El Morro fortress while flying over San Juan, Puerto Rico, and remarked that it would be the perfect look for his new Pirates of the Caribbean, which at the time was still in the planning phase. 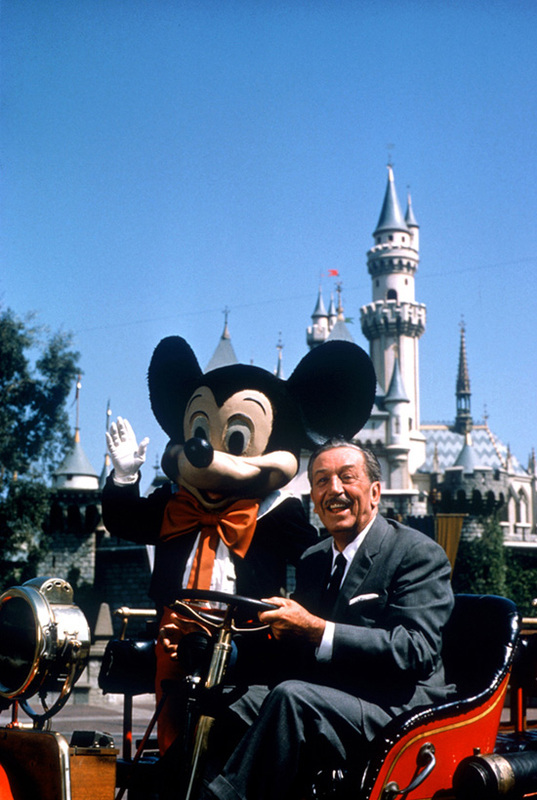 In addition to taking Walt on his secret trips, the plane also took Disney characters on goodwill tours and visits to children’s hospitals around the United States. An estimated 83,000 passengers have flown aboard the plane, including Disney animators and several famous faces, including former Presidents Richard Nixon, Jimmy Carter and Ronald Reagan, as well as Disney Legends Julie Andrews and Annette Funicello. 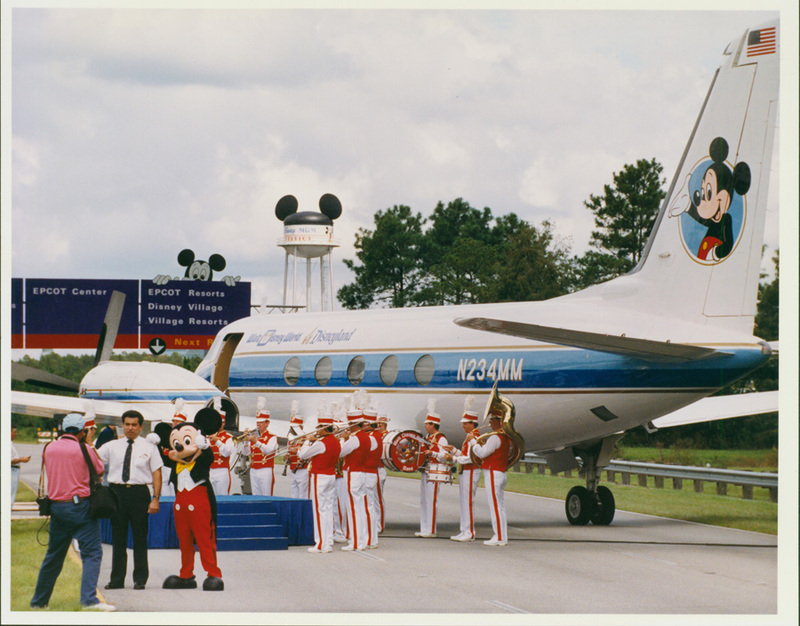 The airplane’s last flight took place Oct. 8, 1992, when it touched down on World Drive, west of Disney’s Hollywood Studios, and was added to The Backlot Tour for all to enjoy. On this special day of love, Reed Milnes, Volunteer Services Coordinator, tells us a bit about a very special gift that Walt gave Lillian for her birthday during the Valentine’s season. Humor is best shared with those you love. Walt shared a lifetime of laughter with the world, but more importantly, he shared love and laughter with his family and friends. His playful sense of humor inspired our lives and was inspired by his own. Images and stories of the relationship Walt shared with his wife Lilly, showed the depth and humor they fostered. Whether celebrating their anniversary playfully dancing at the Golden Horseshoe Review, or in candid photos taken in an automatic photo booth, Walt and Lilly showed the unique bond forged by love and laughter. Often at the center of the laughter and fun was one of Walt’s beloved hats. 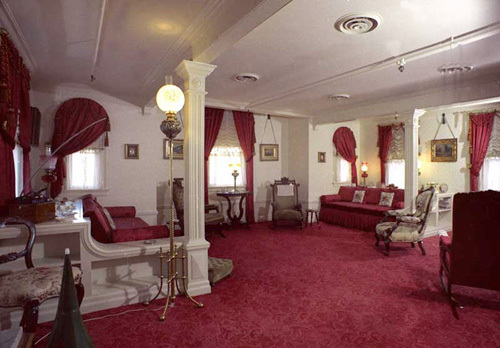 Worn at a jaunty rakish angle, this ever-present fixture became the frequent muse for exchanges between Lilly and Walt. When asked to “fix” his hat, Walt would often respond with an exaggerated crush of the hat on his head. Lilly would occasionally abscond with his hat, sailing it far out of reach before Walt could rescue it from her clutches. A tale fondly recounted is of Lilly offering Walt’s hat as an accolade following a bullfight, flinging it into the ring. It was one of Walt’s favorites, and he narrowly rescued it before it was lost to tradition and a dusty demise. Their love and laughter withstood the test of time. Celebrating this, was another of Walt’s hats, The Hat Bronzed with Love. In a gift presented to Lilly on her birthday in 1941, she found a cascade of violets pouring over their vase. In removing the flowers, their container was revealed to be Walt’s favorite hat with the crown shaped into a heart and preserved in bronze. His crumpled fedora, carrying the beautiful bouquet and boasting his feelings, leaves no doubt that laughter and love go hand-in-hand. via STORYBOARD: The Walt Disney Family Museum’s Blog – the blog – The Hat Bronzed with Love. How Walt Saw It « Disney Parks Blog. To anyone who has read a Walt Disney biography, you know the story of Walt Disney’s 1926 Moon roadster. Walt was quite proud of that car, and it was the very automobile he used to court Lilly. However, after losing Oswald, Walt and Roy fell on hard financial times. Of course, that didn’t seem to disturb the ever-optimistic Walt Disney. Instead, he came up with a new character, Mortimer Mouse (aka Mickey). While there are a number of versions of how Walt came up with Mickey, there is only one story of the relationship between his Moon roadster and Mickey Mouse. This story, is considered to be accepted truth … well, if there ever was any doubt about it, I offer proof now (and the actual dates). When Walt was back in New York recording the sound for Mickey’s third cartoon, Steamboat Willie, he started to run short on money. He kept in constant contact with Roy back in Los Angeles, and they were looking for extra money anywhere they could. 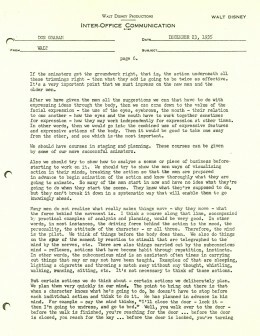 Walt asked Roy in the summer of 1928 to mortgage their Lyric Avenue homes for additional funds. Still, due to problems with the recording of the soundtrack, more money was desperately needed, so Walt, demonstrating his faith in the project, informed his beloved brother to sell his beloved Moon roadster (the latter being the more likely to bring in the cash). The money was not only needed for the work underway in New York, but there are several accounts that it was also needed to meet payroll at the Hyperion Studio (2719 Hyperion). In digging around through various newspaper morgues in the past, I have come up with an unbelievable number of Disney related articles (5000 plus–). Towards the latter days of my newspaper research, it was getting discouraging, as rarely would anything show up that I did not already have (thanks to a database I started from day one, I actually knew). So I got the bright (my wife would say insane) idea of searching for various historical Disney ads. So I present here Walt’s Los Angeles Times classified advertisement (placed by Roy O. Disney … or perhaps Lilly or Edna) to sell said “beloved” Moon roadster. The first time it ran was on Saturday November 3, 1928, and the car was listed at $525. Apparently there was no interest at this price that day or on the following Sunday, Monday, or Tuesday, so the advertisement was run once again on Wednesday the 7th of November. This time, the price was lowered to $475 and, it sold! Mickey got his soundtrack. Disney started an empire. Payroll was made. Thank goodness for this little classified ad (well, and for Walt’s foresight!). 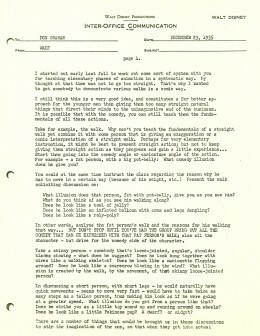 On December 23, 1935, Walt Disney wrote an eight page letter to a gentleman named Don Graham at the Chouinard Art Institute (now Cal Arts) asking him to help train new, and improve old, Disney animators. 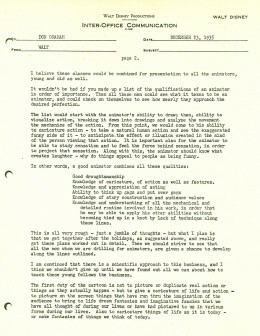 Walt felt that many of the men he employed weren’t working up to their potential and that by focusing on a few simple things, the studio’s output would improve exponentially. 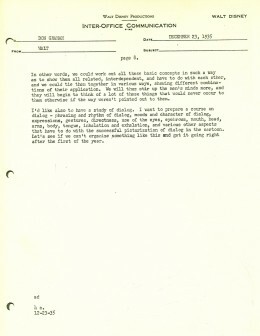 Well, after this letter, the studio released – in order – Snow White and the Seven Dwarfs, Pinocchio,Fantasia, Dumbo and Bambi. So, it seemed to have worked. The letter is a fascinating look into the genius mind of Walt Disney, as it details the unique way he looked at movies, humor, drawing, running a company and much more. He details the minutia – such as body type and rhythm of movement – of animation and implores animators not to ignore these incredibly important things. Animators, or just fans of Disney, should really enjoy this. 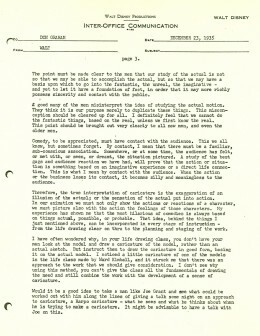 Check out scans of the letter and link to the full transcript after the break. 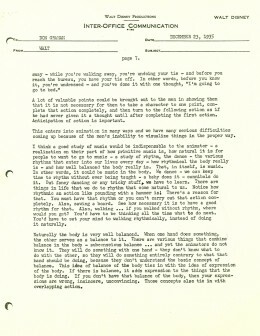 Thanks to Michael Sporn Animation for unearthing the letter and Letters of Note for the full transcription. Click here to read it typed out. Here are a few of my personal favorite quotes, just as a taste. I am convinced that there is a scientific approach to this business, and I think we shouldn’t give up until we have found out all we can about how to teach these young fellows the business. 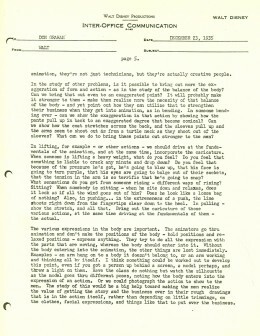 The first duty of the cartoon is not to picture or duplicate real action or things as they actually happen – but to give a caricature of life and action – to picture on the screen things that have run thru the imagination of the audience to bring to life dream fantasies and imaginative fancies that we have all thought of during our lives or have had pictured to us in various forms during our lives. Also to caricature things of life as it is today – or make fantasies of things we think of today. If the animators get the groundwork right, that is, the action underneath all these trimmings right – then what they add is going to be twice as effective. It’s a very important point that we must impress on the new men and the older men. 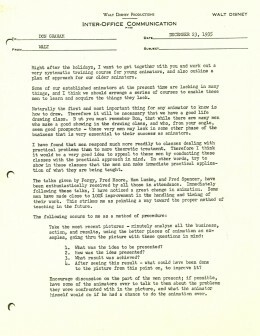 And here’s the letter as it appeared on Don Graham’s desk just before Christmas in 1935.